The original six-year construction plan included extensive demolition and excavation, followed by construction of two gyms, a large underground parking garage, Visual Arts Center, Performing Art Center, complete remodel of the North Wing, increased enrollment, increased Special and Athletic practice and Events. The current construction plan includes all of the above with minimal reductions and has been compressed into a three-year schedule. The result will be continuous construction six days per week for at least three years, with flagmen at Barrington and Sunset frequently bringing traffic to a standstill, starting in May 2017! Archer’s project alone – with a compressed construction schedule now causing overlapping phases and an increase of construction vehicles per day – is certain to create new and unmitigatable impacts, particularly in terms of construction traffic (extending trip times on Sunset Boulevard from the I-405 to and from Pacific Palisades) and environmental impacts such as the increased levels of airborne toxins. Please note that in ALL of Councilmember Mike Bonin’s self-congratulatory communications regarding the Archer project, he completely ignores the issue of construction traffic. 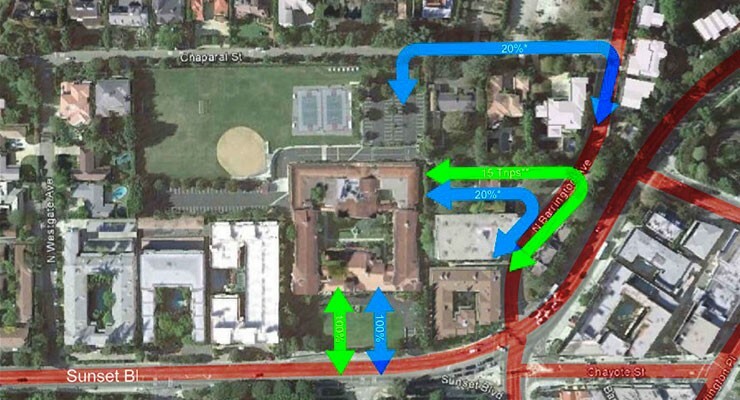 His “plan” to “reduce traffic on Sunset” addresses only post-construction traffic, and even if his plan works (our traffic expert Tom Brohard completely debunks it, see his analysis here) its impact on Sunset traffic would be trivial compared to the 36-month construction traffic nightmare he has approved. Archer’s analysis of air quality and related health issues was flawed and dangerously incorrect, as shown in this letter from our consultants. During the projected peak emission days, under a correct analysis, the estimated carcinogens would exceed permitted levels by 25%. And that was when the demolition, excavation and construction was to be spread over 74 months. Archer has not provided an updated analysis – based on updated schedules of both construction activities and construction traffic onsite – of air quality and health risks, that reflects the compression of most of that work into only 36 months. Even more important, Archer has not updated its analysis to reflect the new March 2015 statewide guidance, which incorporates new science showing that the increase in cancer incidence for “schoolchildren” is ten times what the prior science showed.. In the rush to get this project approved, Archer’s recent major changes have not been subject to proper analysis, disclosure or mitigation. Consequently, neither the general public nor the City Council had the information they need to make fully informed and responsible decisions. There is so much information regarding the intrigue around this issue that we’ve created a dedicated site, The Archer Disaster, a Facebook Page, YouTube Channel and a Twitter Feed exclusively for the Archer School Expansion and its effect on traffic and the environment. Also, please sign the petition telling Councilmember Mike Bonin that the majority of Brentwood neighbors and community organizations still oppose the Archer School expansion plan.